If you’ve ever watched Robocop or either of its sequels, it wouldn’t take long to realize it’s a curious choice for a mainstream set of trading cards where children would be among the target audience. 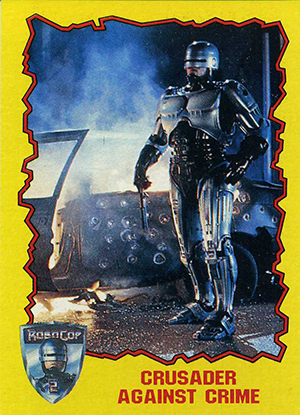 1990 Topps Robocop 2 trading cards do just that, showcasing not only the iconic lead character but the over-the-top violence as well. Let’s not kid ourselves. Plenty of children were watching Robocop at the time. Some parents knew about it. Others probably didn't. By the time the sequel hit theaters, Robocop had his own cartoon. Children were playing with action figures. It had somehow gone from an ultra-violent blockbuster to kiddie fare. Or was it? 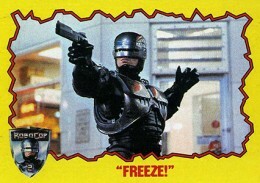 1990 Topps Robocop 2 doesn't hold back on the images. The blood flows freely on several cards. Be warned, a couple of severed limbs are also fair game. The base set has 88 cards. One of the things that's nice about it, and sets it apart from other sequel sets of the era, is that there are cards from the first film included. So for those who weren't allowed to watch the original, even with a cartoon, they could get caught up through the magic of trading cards as well as get a handle on the sequel. Card fronts have bright yellow borders with a red jagged frame the resembles an electric current. The film's logo is at the bottom of the card along with a red caption. 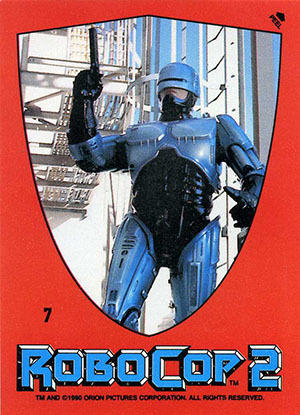 Backs have an illustration of Robocop brandishing his signature gun along with a lengthy writeup. Similar to a lot of old Topps movie sets, the writeup concludes with a prompt to read the next card. Every pack of 1990 Topps Robocop 2 comes with one of 11 different stickers. Done with red borders, these stickers aren't die-cut. Backs fit together to form a Robocop puzzle. Topps also produced a factory set. Done in a style similar to their Topps Tiffany baseball releases, factory set cards have a glossy coating. An additional 22 Behind-the-Scenes cards are also included, which aren't in packs. 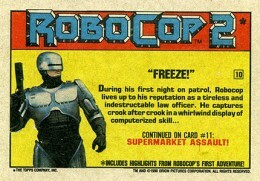 While you might have to buy 1990 Topps Robocop 2 sets and boxes for more than a dollar, the release remains affordable. Although the premium glossy sets are a little tougher to find, nothing about the release is rare and can be found without too much trouble. 180+ Starlog Magazine 1993 Trading Cards. TNMT, Robocop, Star Wars, 007, + more. 31 "Or the Old Geezer Gets It!" 49 "You Can't Be Serious!" 62 No Escape from Robocop! 75 Has Robocop Met His Match? 22 cards. Available only in factory set. T "All Quiet on the Set!" 11 cards. Inserted one per pack. Robocop. 1994 Original Stickers. Set of 22.